"Nigerian nager" and monkey 456. Obviously a racial component but also a multi boxer. He/she also messenges racial noise for fun. I'm here to report Sherk and LCum for multiboxing. In a previous game I played, I was allied with Sherk, however, another player LSug gave me a better deal and I betrayed Sherk for LSug. I had good results from that game, so I got the email of LSug and asked if he wants to play another (he got first and I got second in the previous game, I wanted another chance to beat him since he's a good player) and he said yes. 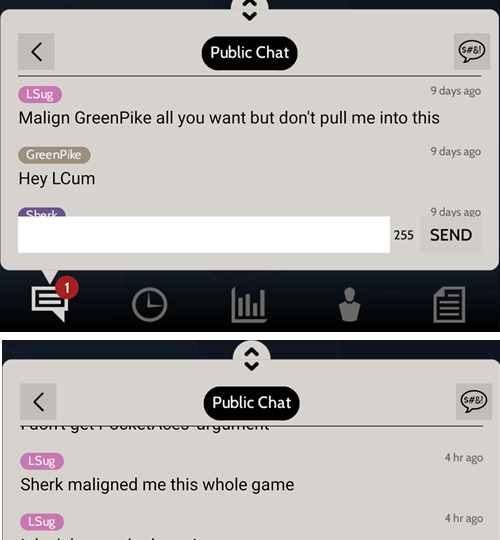 I made a game, and he joined, but Sherk was really angry, and in the next game, he joined my game as well and made another account (LCum). Literally the second the game started, he started calling me a multiboxer and LCum started saying that he's MY alt account, when I have no idea who that even is. I denied it, telling people that I'm no multiboxer because, well, I'm not. However, 1 hr into the argument, Sherk started talking about how LCum will gift his stuff to me, LCum actually GIFTED all his drillers to me. That is too much to be a coincidence. I asked LCum what he is doing and he never replied. I'm pretty sure that LCum is Sherk's alt and he's doing this for revenge. Guys, watch out! I've never seen this type of maligning before, but be careful of people like Sherk. They will make another account, join a game with you, gift all their stuff to you, and report you for multiboxing just because they hold a grudge from another game. Do not get trolled by him like I did. 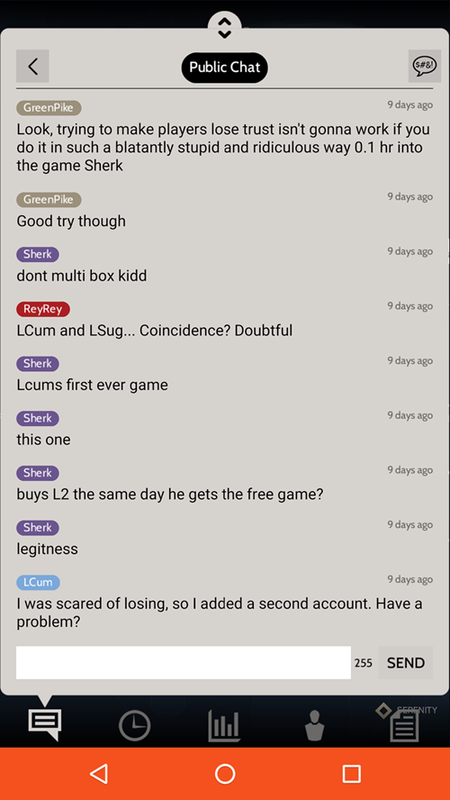 If you see Sherk or LCum join your game, KICK THEM! greenpike wrote: I'm here to report Sherk and LCum for multiboxing. In a previous game I played, I was allied with Sherk, however, another player LSug gave me a better deal and I betrayed Sherk for LSug. I had good results from that game, so I got the email of LSug and asked if he wants to play another (he got first and I got second in the previous game, I wanted another chance to beat him since he's a good player) and he said yes. I know that this is going to sound like a game of "he said, she said" but I'd like to add some enlightening information to Greenpike's story. 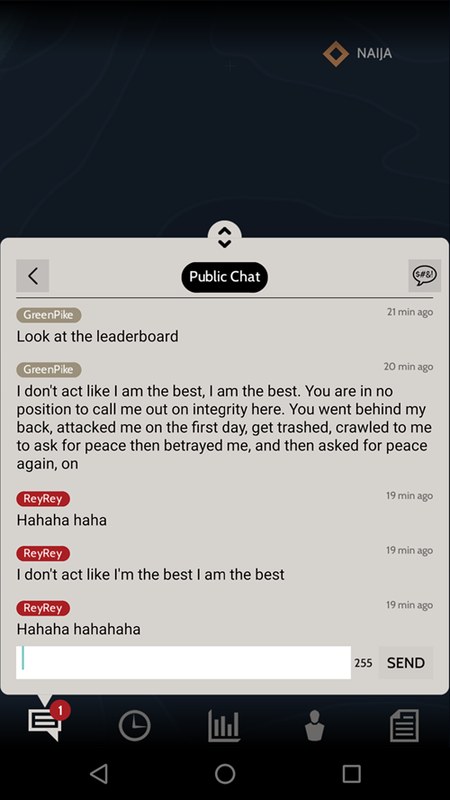 While I don't know entirely whether Greenpike and Lsug are multiboxers - or just know each other and regularly ally & share information together, but I do know that neither of them can be trusted. You should be EXTREMELY WARY if they are in any of your games - especially if both of them are in it together. I'd like to point to a few facts to help make my case. 1. Both of them continuously claiming that they don't know each other and have never played each other before when that is blatantly false. 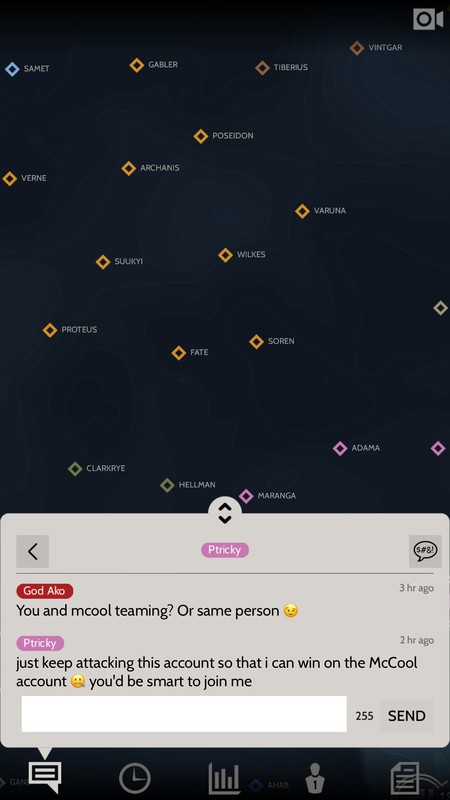 Even in the post to report the "other" multiboxers he claims they only just played together for the first time last game. greenpike wrote: I had good results from that game, so I got the email of LSug and asked if he wants to play another (he got first and I got second in the previous game, I wanted another chance to beat him since he's a good player) and he said yes. That directly contradicts the below post from a thread trying to plan a team battle. Greenpike: "I have never played him before"
2. Use of the term "malign" between the two of them. Similar phrases, writing styles, and the usage of the same uncommon words is a good thing to look for. 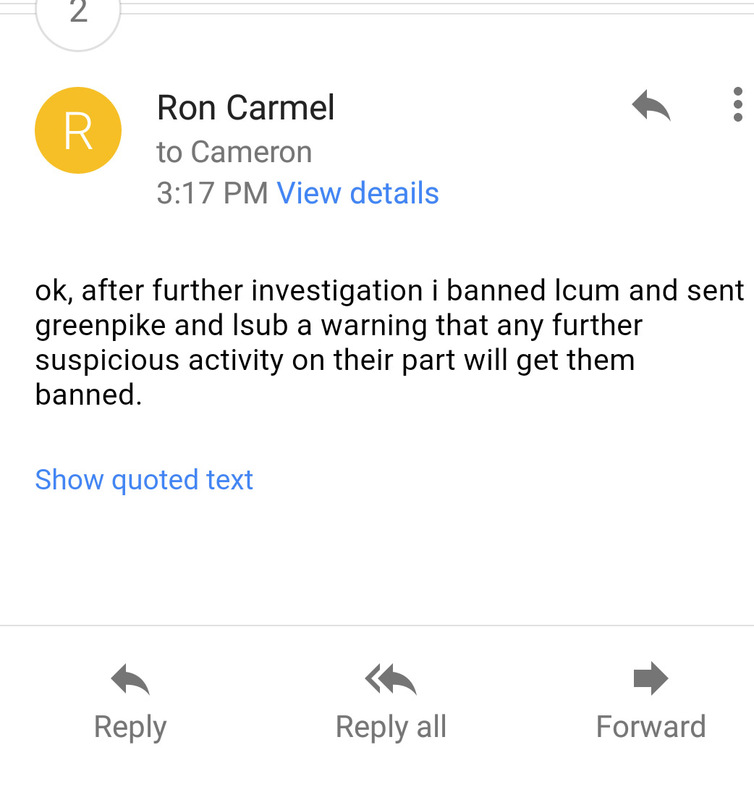 LSug uses it in the game and Greenpike also uses it here in this forum. I don't know anybody else who has ever used this word regularly. 3. They both have very similar join dates, games played and medals. Lastly, I wanted to end with one last thing. After this Lcum player donated all of their specialists, troops, and bases to Greenpike he used them to (obviously) turn around and win the game. You'd think that someone who was given everything in the game would have just an ounce of humility. You'd be wrong. To be honest your argument is absolutely fanatical. I had a completely normal alliance with LSug. There were no illogical gifting or anything of that sort. We emptied borders with each other and teamed up on weaker players we both happen to border just like any good player . So did 5 or 6 other people in the game. I lied when I said that I was your ally, so what? 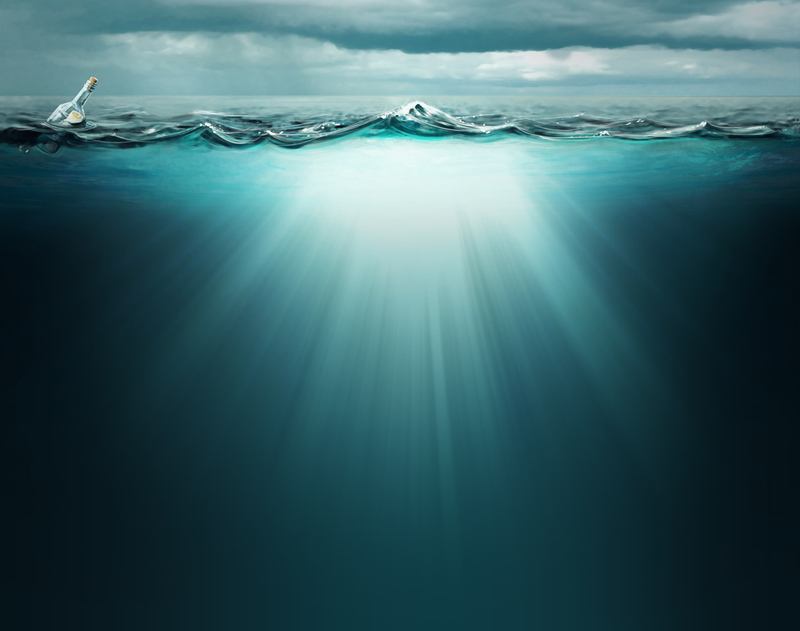 The name of the game is Subterfuge, you were clearly about to backstab me, nothing wrong about me doing it first. You think we are the same person just because we used the same word once? Pfft. Scroll up, it was in public. 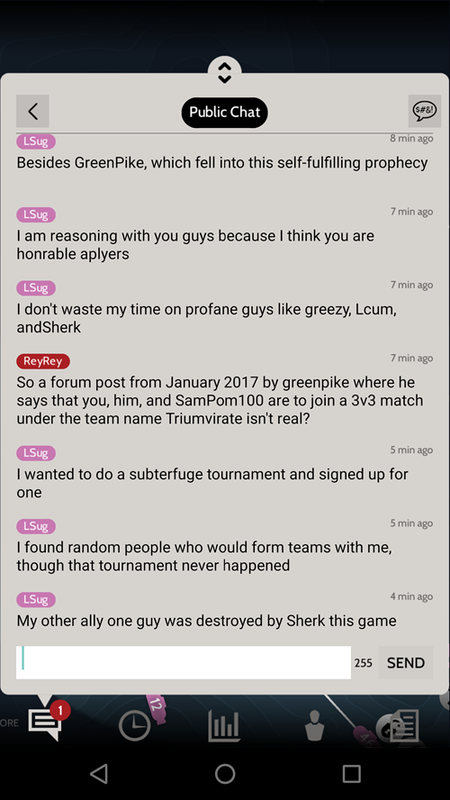 I called Sherk out for maligning me, LSug saw the chat and said the same thing because he was too blatant in his attempt. How does that make us the same person? If you said the word "China" or "wall" does that make you Trump? You were targetted because you attacked me the minute the game started. What's even more curious is that right after Sherk called ME a multiboxer, a random account joined, said that he is MY alt, and gifted all his stuff to me. Now, if that really was my alt, why on earth would I tell every single player that he's my alt? I'll have to be insane to do that. Your attempt to sabotage my reputation was way too transparent. You did not make good allies, and you lost, no shame in that. Happens to everyone once in a while. But spreading rumors and trying to ruin people's names? Grow up, it's a game. Don't resort to something so low. Last edited by greenpike on Fri Apr 14, 2017 6:47 pm, edited 1 time in total. Just throwing this out there.. Innocent people don't get warnings from creators of the game. This seems like it's been resolved but if you've got anything else to say, I'd ask you to take it elsewhere. Excuse me why on earth am I on this list? Lol plz devs investigate my games and prove my innocence i will continue to use my account but i honestly dont have multiple accounts. neverplayingagain wrote: Worse cheaters and manners I've ever had in a game. If anyone sees these assholes on a server, please jump them with friends. May also be with prof_porridge, liquos, and Rorik1356. Why aren't you playing again? Lol wow this guy is just mad and came on here and reported me? 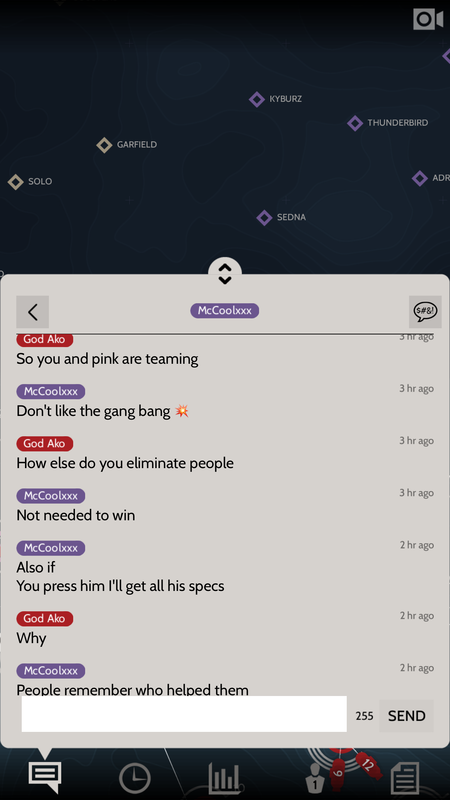 Yes those players we all teamed up and formed an alliance and hes mad.